Free-Form Embroidery with Judith Baker Montano is a beautiful thing. I wasn't completely sure if I was going to want it since I already own Elegant Stitches and have read her other two books. But I'm definitely in love with this book. Yes, there is some information that you will find in the other books, but this volume goes far beyond the others with the artful addition of paints and dyes, felting, and what I'd have to call mixed media stitching. Not just ribbons, not just floss, not just yarn...everything! I love the organic designs that Judith features, the landscapes and seascapes. 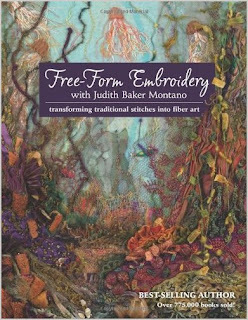 She begins with an exhaustive list of fabrics, threads, yarns, and ribbons, and moves into 60 beautifully illustrated stitches that will add texture to your own -scapes. Judith explains her process and shows how she makes on-site drawings and notes her observations in a small watercolor journal. Later in the studio, she draws detailed images with Pigma Micron pens and fills them in with pencils and watercolor paints. This attention to detail is what makes her -scapes work so well: one of the keys, she says, is to know what the specific growth patterns of real plants are. The landscape won't look real if the components aren't real. It might seem obvious, but I'll bet some of us hadn't really considered that before. Judith includes many of her journal paintings along with her notes on the features of specific trees, bushes, flowers, etc, and what techniques and stitches would emulate them the best. She also points out that you'll want different techniques for background items than for detailed foreground ones. My favorite chapter is "Think Like a Painter", which features many of Judith's finished mixed media embroidered pieces, along with background information on how they came to be. My other favorite is "Laguna Pueblo", which follows the creation of one extremely complex landscape from initial conception to the end. This is yet another gorgeous offering by C&T Publishing. You are soooo good at spending my money for me, lol! Its a good thing its the holiday season soon! Its gone on my wishlist too! There are so few books like this around, and most only seem to touch upon this sort of subject matter in passing. I learn more from blogs like yours than books, so its good to get an honest assessment of a new book, particularly as I will have to buy it by mail order, sight unseen. No local bookstores any more.